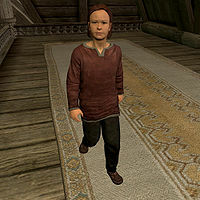 Nelkir is a Nord child and the youngest son of the Jarl of Whiterun, Balgruuf the Greater. He can be found in Dragonsreach. When spoken to, he will rudely dismiss you with "Another wanderer, here to lick my father's boots. Good job." Nelkir wears red colored child's clothes and a pair of shoes. He carries a selection of food and toys, and a small amount of gold. A rumor passed on by the publican of the Bannered Mare will lead you to investigate the Jarl's children and Nelkir in particular. During this quest, Nelkir will also reveal many dark family secrets to you. When you question Nelkir about his dark attitude, his remarks make it clear that the rumors were true: "So the disgusting pig sent you to bother me? One day, I'll tear his face apart so he can leave me alone." He will go on to say that "My father doesn't know anything about me. But I know about him. And about the war. More than he might think." When you ask him what he knows, he will reveal some interesting information: "I know that he still worships Talos. That he hates the Thalmor almost as much as the Stormcloaks do. That he worries about being chased from Whiterun." He will then, hesitantly, add "That he... that I'm... that I don't have the same mother as my brother and sister." If you ask him how he knows all of these secrets he will tell you that "This castle is old. Lots of places nobody's been in a long while. Places where you can overhear things. See things." He will then finish by saying, "And the Whispering Lady." If you question him further about who this Lady is he will remark that "She won't tell me her name. I've gotten good at listening to keyholes. At the door in the basement, I hear her talking to me. I thought I was caught, but she started telling me even more secrets. But I can't open the door." You may then ask him about the door and he will tell you "In the basement. Trust me, you'll see it. I bet she'll talk to you, too." If spoken to after the completion of The Fallen but before you begin The World-Eater's Eyrie, Nelkir will dryly remark, "A dragon in Dragonsreach. That's something I never saw coming." If Whiterun is conquered by the Stormcloaks, then Nelkir's father moves to the Blue Palace but he does not. Also, his dialogue does not change. This issue has been addressed by version 1.2.2 of the Unofficial Skyrim Patch; he will move to the Blue Palace. Nelkir's relationship with Jarl Balgruuf is marked as "brother" in the Creation Kit, despite all dialogue referring to him as the Jarl's son. This issue has been addressed by version 2.0.5 of the Unofficial Skyrim Patch; he is now marked as Balgruuf's son. This page was last modified on 4 January 2019, at 19:52.